EnCana entered into an agreement to buy Athlon Energy for $7.1 billion (click here). 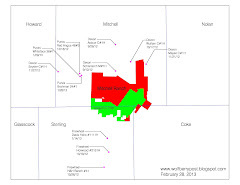 Lynden Energy has 5,883 net acres in the same counties! w/ 143.4 million fully diluted shares and discounting 20% as Lynden is not an operator, this translates to a per share price of $1.67/share US$ not including any value for Lynden's 52,000 net acres at Mitchell Ranch.